At some point in time we've all turned down an invitation to a get together or event because our spouse, children or parents complain that we don't spend enough "quality time" with our family. What do they mean by quality time? We take it to mean the time set aside to spend with (and pay our undivided attention to) our loved ones which is in some way important, special and productive. The level of importance, intensity and value attached to the concept is what makes it count. 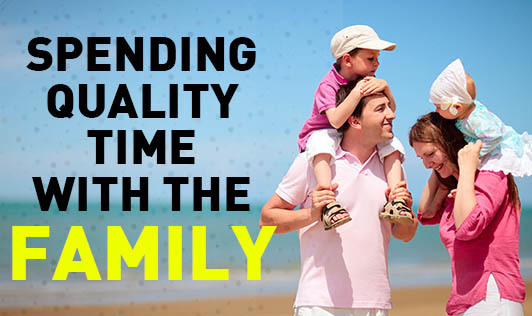 What actually defines quality time can vary from family to family. For some, planning a weekend trip to a popular entertainment or cultural destination can be seen as quality time. For others, having dinner together or spending an hour together every evening counts. The point of the exercise would be to spend that quality time learning how to relate with other family members, how their day/week was, what are their current likes/dislikes (with children this changes on a bi-weekly basis, so it's best to keep up) and vice versa. Schedule a date and time, in advance, to do something that everybody in the family enjoys. Mark it on the common calendar and in your personal diary. Try to have breakfast and dinner as a family. If you work shifts, perhaps lunch? Sometimes with late hours of work it's not possible to do so. That's why it's so important on the days that you are home to take time to sit down with your family and really get some quality talking time in. If you've got teenagers this is probably the one place you are going to have a chance to ask them about their day without feeling really threatened because they have a plate full of food in front of them. Take some time and ask them what's going on at school, with friends, or with an extracurricular activity. It may not seem like much, but it lets them know that you're still thinking about them even though you have a crazy work schedule and that you want to hear about their life. Given some offices work on Saturday, commit yourself to the family on Sunday. This means a STRICT no to taking work home on weekends. What's the point of being physically present but mentally at work? Family vacations. This will obviously take more than just five minutes of your day but if it is well planned and thought out it can really give you the quality time you have lost and need with your family members. Nobody can work every day of the year and with all that working you must have accrued at least a weekend to get away, so take some time and plan things out. Sit down with family members and talk about doing something fun for the weekend. Ask them for their input and see what comes out of the hat. If you enjoy camping then try that. Or maybe you just want to take a quick trip to see some relatives and spend time together there. Family vacations are all about spending some quality time together so don't hesitate to take one. After all those extra hours at work you (and your family) deserve it. Simple activities like a family cricket/football match, going to the park or the beach, going for a movie together, spending the day at the amusement park.... can make a world of a difference! You don't have to feel guilty about working long hours if you can come home and spend some quality time with family members. There are hundreds of ways to do it; you just have to be motivated. Pick a favorite activity, get together, and just learn more about each other. And there is no right time to start. So start today!